Model villages. We’re not talking about Legoland here, though that does kind of count I suppose. It does indeed appear I am not alone in my fascination for recreating the real world in miniature form. This chap, Tim Dunn, has taken his childhood fascination to an extra level and is busy documenting and recording—even saving parts of—model villages and towns of all kinds. The Perimeter is a photography project by Quintin Lake based on walking 10,000km around the coast of Britain in sections. The journey started on 17th April 2015 at St Paul’s cathedral and I’m following the coast clockwise. I expect the journey will take around 5 years. What a brilliant idea. Bookmarked. Hello. It’s been a while, hasn’t it. Sorry about that, but I’ve been busy. Larking about updating blogs has been fairly low on the agenda. I have been updating the social media stuff, but this blog needs a little more time and thinking about. Well, Just Like The Real Thing asked me if I’d like to demonstrate building their kits at one of the biggest O Gauge shows in the country. With all expenses paid, who could refuse an offer like that? At the same time, they were to reveal a new diesel loco kit, and I got to build the show stand version, which you can see above. The weekend was quite successful. I think I picked up a couple of new clients—which was part of the exercise—and had a good old chat with friends old and new. I think we may do it again. I set about this tender, which matches an Austerity 2-8-0 which I have yet to begin. This build was an exercise in refreshing my head after some tussles with the coach kit lurking behind it. There are still unresolved issues with that build, but I think I can see a way forward. 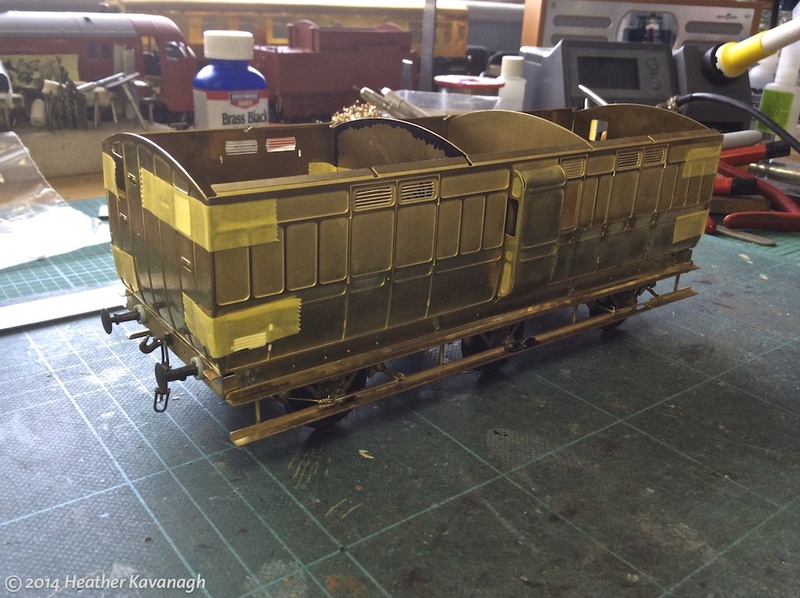 Fun and games have also ensued with a GWR broad gauge passenger luggage van build. This is proper old school modelling, as it used to be back in the 1970s and 1980s. The basic body shell is provided by the Broad Gauge Society, but the underframe, suspension, door handles, couplings and plenty more, have to be sourced from various suppliers. The underframe has been built, dismantled and rebuilt several times, and I think I’m almost happy with it now. I’ve finally got the body parts soldered together, and some thoughts are forming about how to tackle the roof. The client is happy, and seems intent on sending some more kits my way—so I think it’s time I set up a dedicated broad gauge test track to make sure things are running nicely. 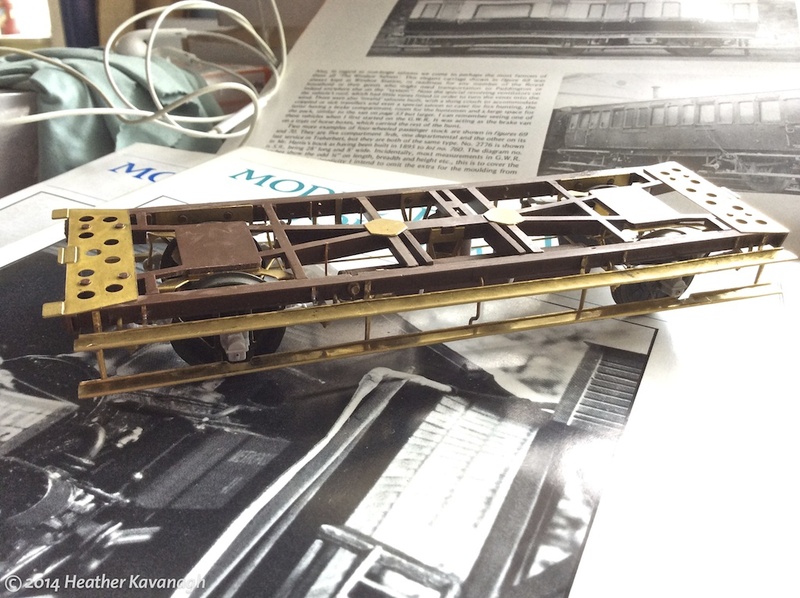 On a similar tack, and a similar vintage to the broad gauge vehicles, I was commissioned to “breathe my magic” on three Slater’s GWR 4-wheeled coaches. They had been acquired second-hand, and came in various stages of completion. One was unbuilt, one was mostly built, and one was, quite frankly, a basket case. This is the unbuilt kit, or rather was the unbuilt kit. I’ve made up the underframe and begun the body work. It’s helped me understand how the kits go together so I can disassemble the basket case and make it properly. This is various parts of the basket case. 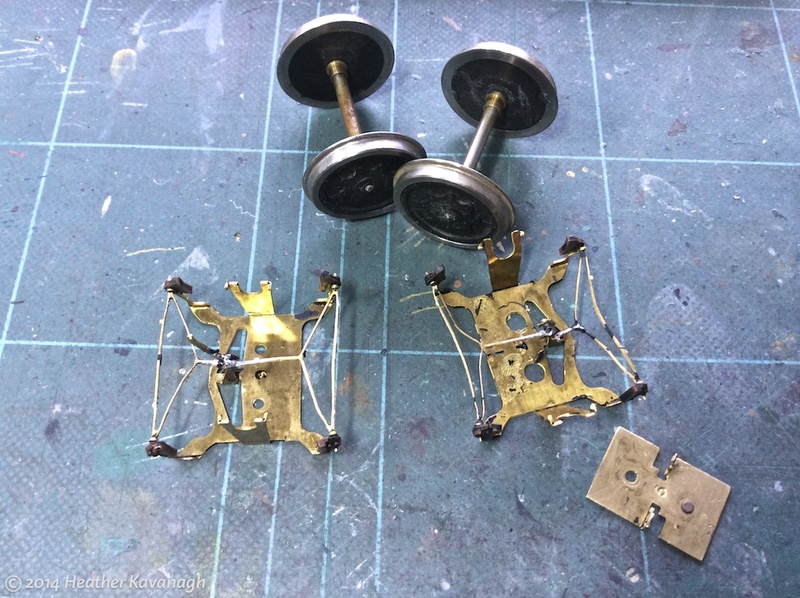 I’ve stripped the model down, stripped some frankly appalling paint off the body, and retrieved most of the underframe components for cleaning up and repairing. The plan is to get all three models to more or less the same state of build so they can be painted as a batch. That’s just some of the work I’ve been up to lately. I haven’t mentioned the diesel and electric locos being worked on, or the ready-to-run diesels waiting for the client to source detailing parts, or the steadily growing waiting list of commissions that should see me busy well into 2015! In the meanwhile I’ve found time to revamp the web site, although it needs some work to make it play properly with mobile devices. You can keep up with me on Twitter (@snaptophobic) and Facebook (search for Heather Kay Modelmaker), and I am a regular poster on the Western Thunder forum. 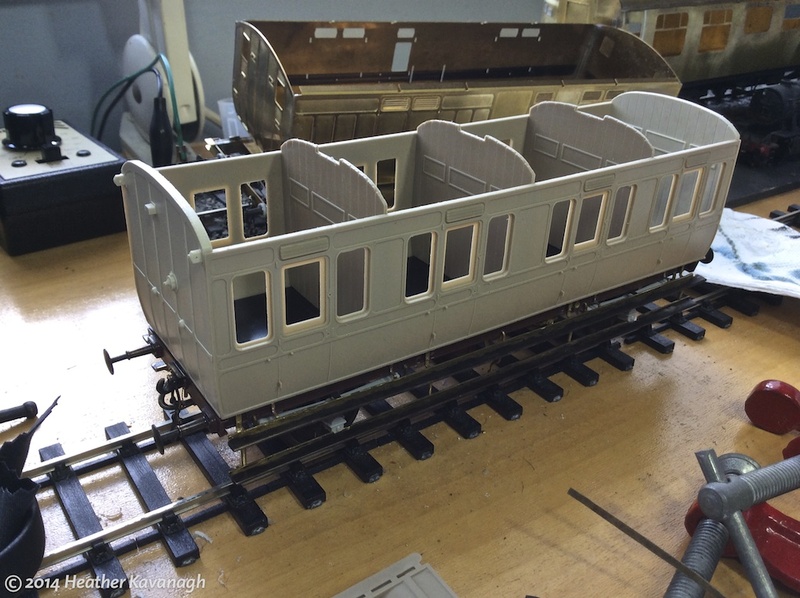 The Mark 1 coach build is nearing completion. As I type the sides have been given a top coat of varnish to seal the transfers in place and protect them and the paintwork from handling. Placing the transfers has taken me a couple of days to complete. The chosen livery has two colours, and the demarcation between them has fine black and gold lining. The way the colours split means two parallel rows of lining on each side, so eight sets of lining to do in total for this build. I used waterslide transfers from a company called Fox Transfers. If you’ve ever built an Airfix kit, you’ll know what I mean by “waterslide”. You trim out the transfer you want and immerse it in water for some seconds, and then it slides from the backing paper into place on the model. The caveat with Fox’s product is it really does like warm water, and the problem then becomes how to keep water at a suitable temperature over an extended period. My solution involves an aluminium baking tray and a tea light! The lining transfers take time, because you can’t simply immerse an entire length and expect to slide it off in place. Tangles and tears are guaranteed, so the method I use is to trim the lining down to manageable lengths, no more than about 40mm, and place them carefully along the coach side. It takes longer, needs a deal of patience (and a powerful magnifying lamp in my case), but the results speak for themselves. This technique also works across door and panel joins, rather than trying to push the transfer down into the gaps. 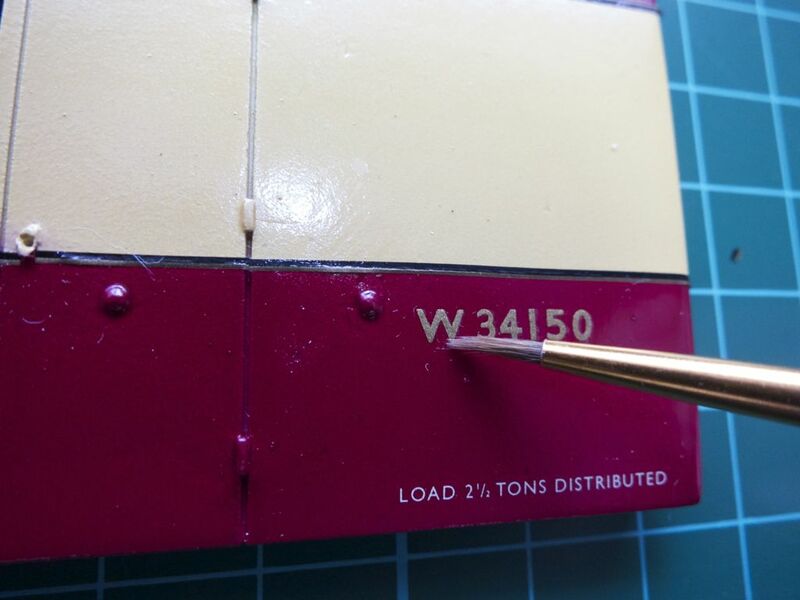 Once the lining was done, it was time for the running numbers. Again, Fox Transfers came into their own. I used a fine brush to guide each individual number into place, before gently dabbing excess water away with a cotton bud. Thoughts are now turning to weathering the models. 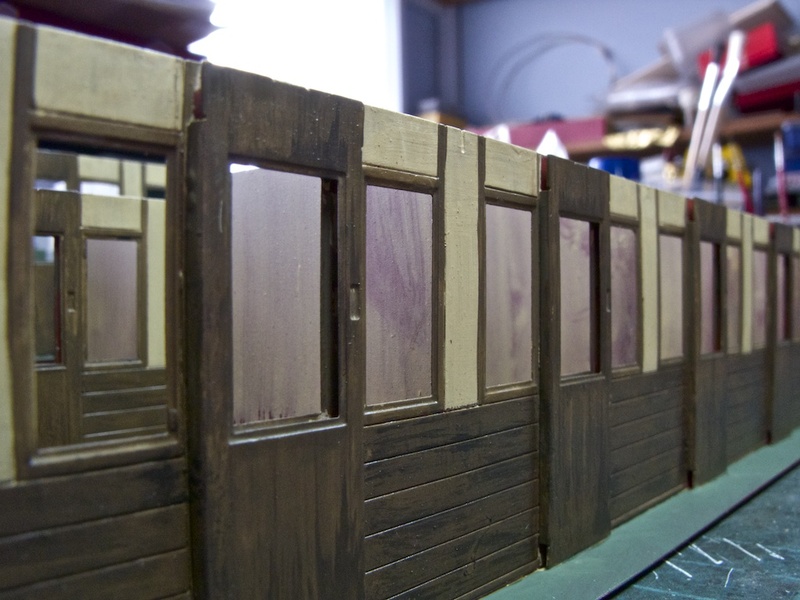 My client requested a “slightly tired” finish, so I’ve been studying as many photos as I can lay my hands on to get a feel for how mainline coaching stock weathered in service. This is also an excuse for legitimately lounging about with a hot mug of tea, perusing lots of books! 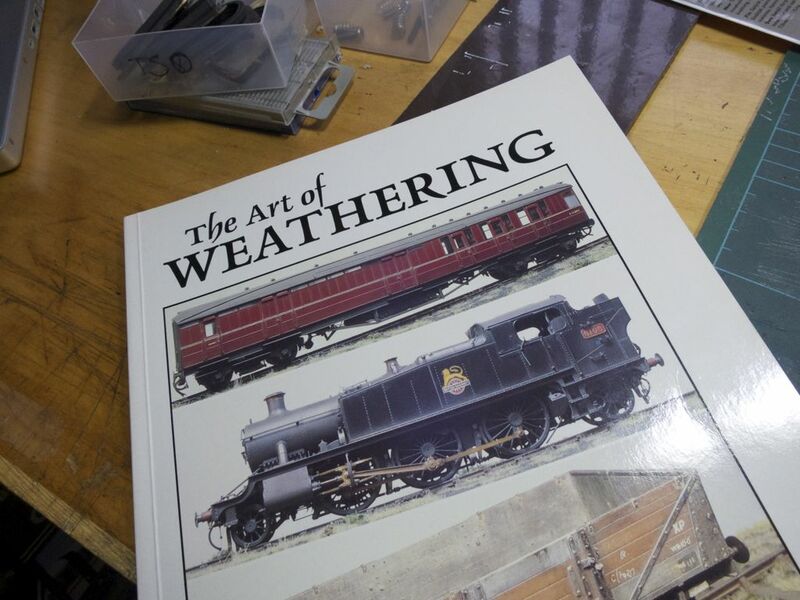 The publication of choice is currently Martyn Welch’s The Art of Weathering, published by Wild Swan. An excellent primer in the various techniques and tools required to achieve a realistic finish to scale models. Currently, I am considering weathering the sides before I finally assemble the models. I can do the same for the roofs, ends and underframes. Once assembled, a unifying dusting can be applied if required. I hope to document the process, so watch out for further posts. I am a professional model-maker. I make models of all kinds, at all scales, and to all requirements. I currently have three more 7mm scale coaches and a 7mm scale locomotive in the queue for my workbench. Have a look at what I do over at my web site. You can also find me on Facebook: search for Heather Kay Modelmaker. 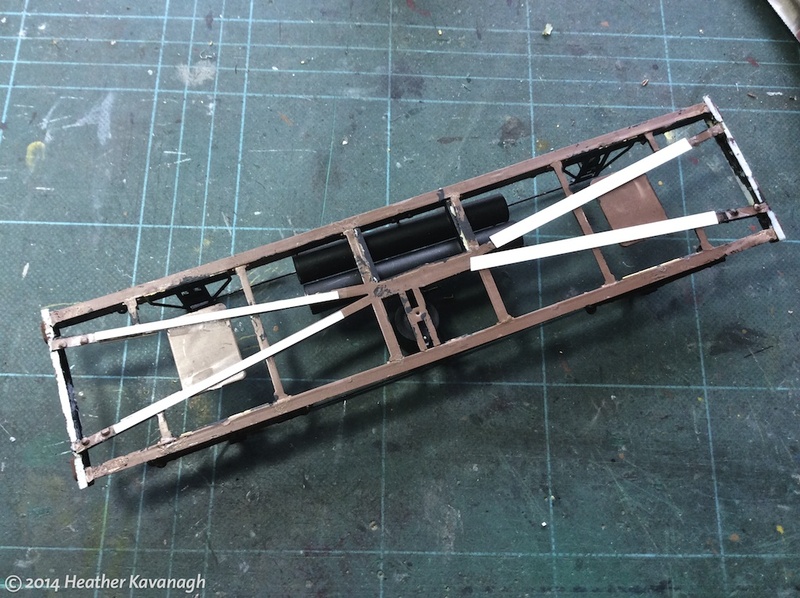 Rapid progress is taking place on the current workbench build. 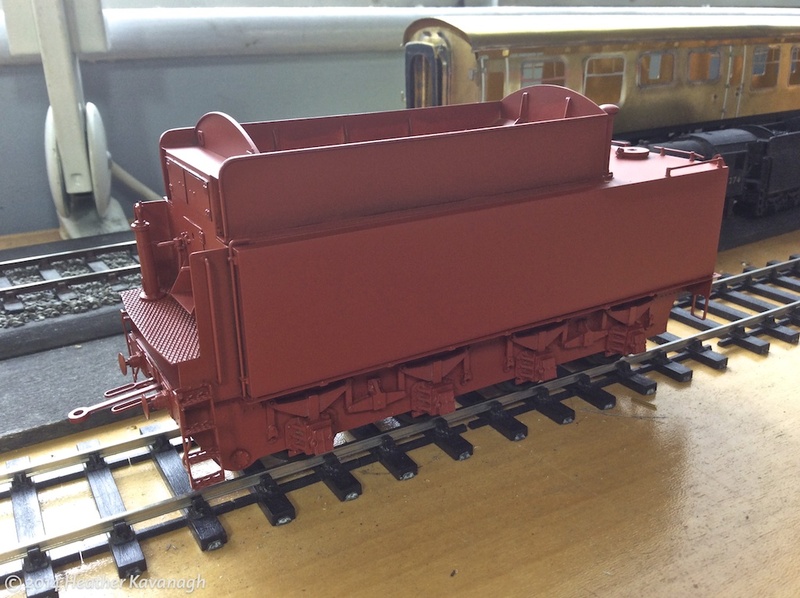 Three ex-GWR Collett 57ft bow-ended coaches are being built for a client. The interiors are all but complete, I’m considering the passenger positions and what colour their clothes will be, and I’ve begun to detail the sides and ends. I hope to be able to get the sides painted next week, all being well. 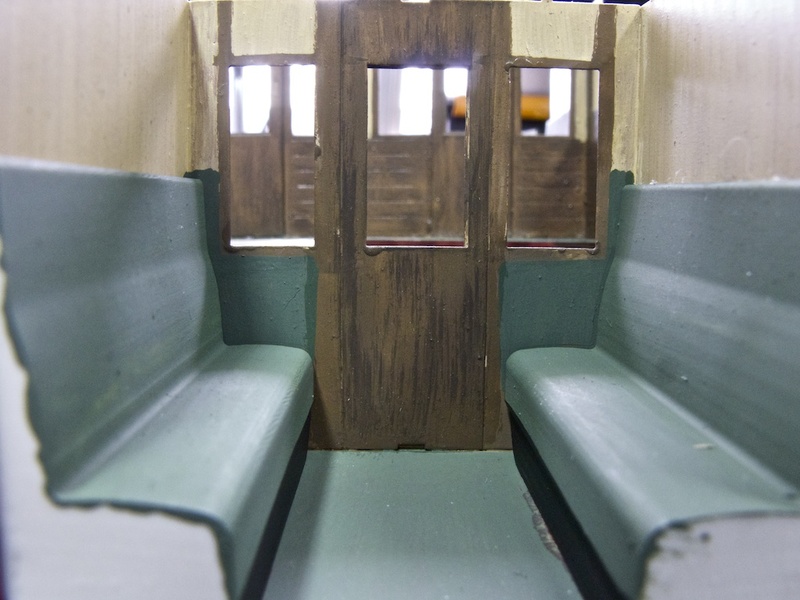 Interiors for three coaches almost complete. Looking down a corridor side of one of the interiors. Close-up of a third class compartment. You can find out more about my professional modelling activities on my web site. Pop over to www.heatherkay.co.uk and have a look around! We have two cats that live with us. 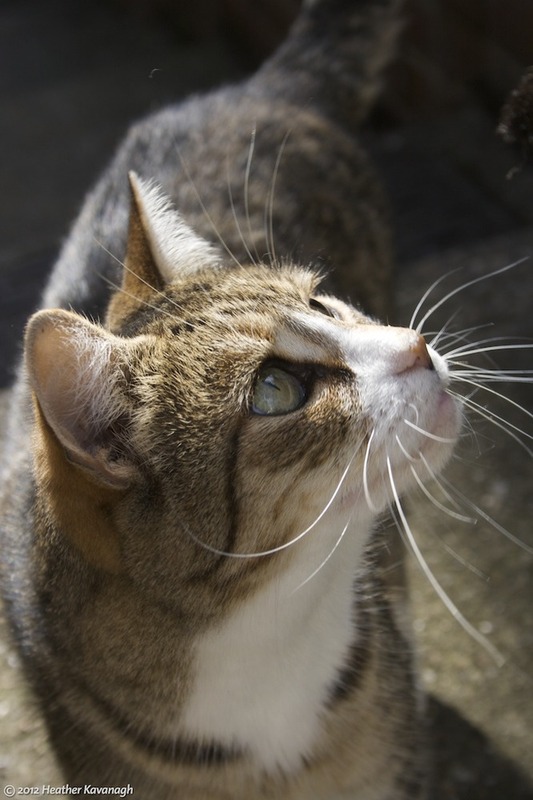 We homed them from our local Cats Protection rescue centre, like all the moggies we’ve had before. The current pair, Sophie and Penny, also affectionately known as Charlie and Pingle, have been with us since Easter 2007. They came as a set, even though they are not related as far as we can tell. Sophie seemed to be the dominant one, always on the lookout for a vacant lap, howling for attention and so on. Penny was quiet, a bit introverted, and would accept a cuddle, but only on her terms. 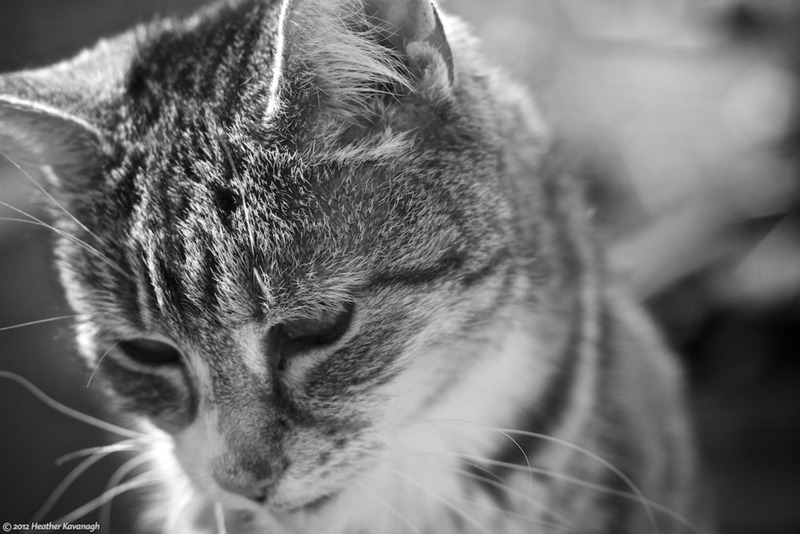 Over the years, though, it’s become obvious that Penny is the eldest, and therefore was Top Cat. Penny frequently put Sophie in her place, usually with a paw round the ear. 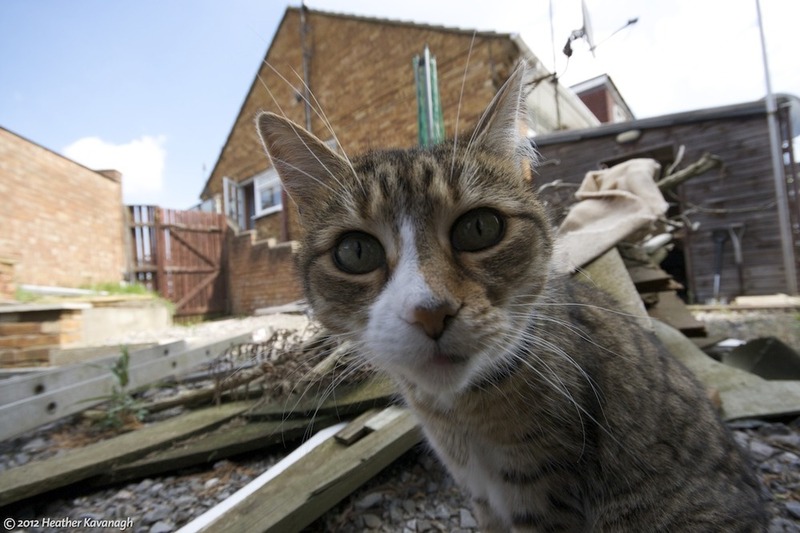 Penny also came out of her shell, and turned out to be an adorable, cuddly moggy who loved to be nearby keeping an eye on what you were doing. Our previous homings had been fairly poorly, and didn’t live long with us before they were called to the Great Cat Flap In The Sky. Penny and Sophie are pretty healthy. Well, Penny is actually quite a bit older than Sophie—we’ll never know exactly how old—and she’s now really showing her age. We noticed things weren’t quite right when her poop wasn’t as solid as it ought to be. We also noticed she seemed confused and unable to march confidently about the place as she had done of old. We took her to the vet, who kept her in for blood tests and treatment. Everything seemed to check out fairly well, apart from being a bit anaemic and dehydrated. Penny got a course of antibiotics, but was otherwise deemed fit. Sophie didn’t like the way Penny ponged of vets, hissing and growling at her. That earned Sophie a black mark from the staff, that’s for sure. We’ve worked out Penny has colitis, which means she’s not able to absorb all the moisture from the regular cat food (which is, frankly, mostly water anyway). This was why her poop was so bad. The antibiotics also gave her some incredible flatulence, resulting in some remarkable noises and equally remarkable fragrances from such a relatively small cat! Explosive puss poop and pongs! Not helping was Penny’s inability to point her backside in the right direction when in her litter tray. I have become resigned to clearing up spillages when I get up of a morning. At least it’s a laminate floor around her tray! I checked on the internetz, and worked out what we might be able to do about Pingle’s poorly tummy. I checked with the vet to make sure they agreed with the diagnosis and recommended treatments. Penny has now been put on a special diet of biscuits which contain turkey and rice. Sophie, meanwhile, is still on the same old cat food diet, and it’s quite a job preventing Penny from piling her nose into Sophie’s bowl at feeding time! It’s been a couple of weeks now, and things are beginning to improve. Penny is putting on a bit of weight again, and is more or less back to her old self again. The poop is improving slightly, wich makes it less of a chore to tidy up. Sadly, one thing isn’t getting better, and that’s her eyesight. Penny seems to have lost most of her vision. She seems to be aware of contrasts, but she’s very wary when approaching things like steps, or changes in colour on the floor. An exploratory paw comes out and feels about before taking the next step. She’ll merrily blunder into legs, or Sophie—which is rewarded with a hiss and a growl—but she knows the local area well enough that she can find her way about fairly well. She can still hop over the boundary fence into our neighbour’s garden. She can hop up on to the window sill—though she will occasionally misstep and take a tumble to the floor. More importantly, she knows exactly where her food bowl lives. We are slowly becoming accustomed to caring for a geriatric puss. Penny-puss must be well into her teens now. 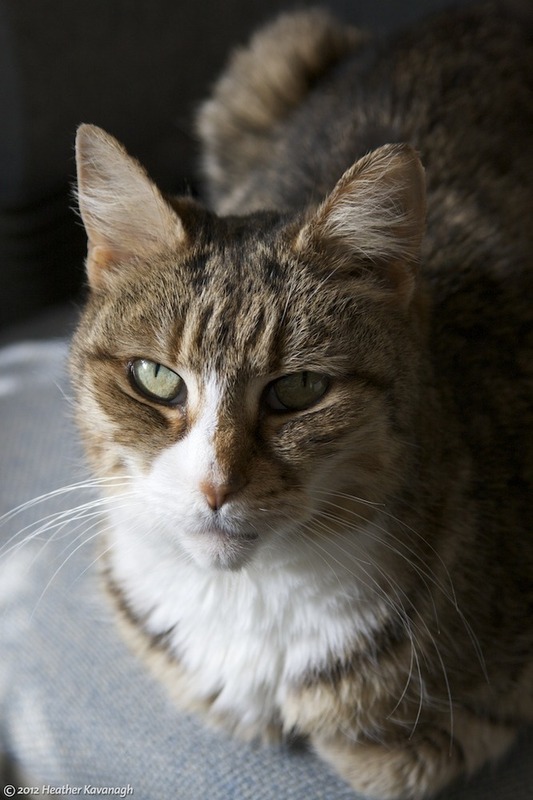 She’s still adorable, and still loves a cuddle, but we must accept the fact things may never be the way they were when that timid little tabby came into our lives. Eventually, her spring will run down. We’re not sure whether to find a replacement, since Sophie may not agree, or whether to just put up with Sophie alone until it’s her turn to leave us. It’s been a blast having two feline friends around the place, but I think I’d be happier with just the one next time we look to home a cat. It was expected to be just another lump of dull basalt, but the first rock examined up close by Nasa’s Mars rover proved to be a little more interesting. The pyramidal object, nicknamed “Jake Matijevic” after a recently passed mission engineer, had a composition not seen on the planet before. Scientists have likened it to some unusual but well known rocks on Earth. These form from relatively water-rich magmas that have cooled slowly at raised pressures, said Edward Stolper. This story about Mars Opportunity is full of fascinating information about recent discoveries the car-sized rover has made in Gale Crater on the Red Planet. I have to say I usually like what the BBC’s Jonathan Amos writes, but this one made me stop and wonder. A recently passed mission engineer. What has he passed? Wind? Go, and not collected £200? His 11+? A-level Chemistry? Driving test? Ah, of course. It’s that odd American English way of saying someone has died. ’E’s not pinin’! ’E’s passed on! This parrot is no more! He has ceased to be! ’E’s expired and gone to meet ’is maker! ’E’s a stiff! Bereft of life, ’e rests in peace! If you hadn’t nailed ’im to the perch ’e’d be pushing up the daisies! ’Is metabolic processes are now ’istory! ’E’s off the twig! ’E’s kicked the bucket, ’e’s shuffled off ’is mortal coil, run down the curtain and joined the bleedin’ choir invisible!! THIS IS AN EX-PARROT!! UPDATE: 14/10/12 Someone at Auntie must read this blog, or sees my Twitter feed. The word “passed” has been edited to “deceased”. A bit of fun for everyone. Upload a JPEG and choose your filter. David duChemin – World & Humanitarian Photographer, Nomad, Author. » Snake Oil & Comb-overs: A Rant. Amazing photographs are not made with plug-ins or Photoshop actions. They are made with the imagination and the heart and the mind. They are made with hands that know the camera well and with a mind that understand how to use it in service of vision. They are made from amazing light, great lines, and astonishing moments. No plug-in in the world will turn a mediocre photograph into something amazing. Patience makes great photographs. Composition makes great photographs. Vision and a desire to express makes great photographs. A great many things make great photographs; plug-ins are not among them, because if a plug-in or an action is a part of polishing a great image, and they can be, that image was already great. I respect someone who is prepared to stand up and say what they really think. David duChemin is someone I respect. I am someone who is learning the craft of getting it right in the camera. It doesn’t always come off, but that’s part of the learning process. Yes, I do use some presets in Aperture, but I use them to make a good photo better. I hope I’m good enough to spot when I am trying to make a silk purse from a sow’s ear.